I love products that have an old school touch. Classic, traditional design is popular with the men, which is why I know they'd love anything made by Lineaus Athletic Company of Marfa, Texas. These football and rugby balls are as gorgeous as they come. Made with full grain baseball glove cow hide, each one is made super sturdy, using three cords of polyester thread, double locked-stitched. Then there are the heavy balls, available from 1lb to 5 1/2 lbs, along with this impressive and ultra cool medicine bag. I also really like this squat bar, because why not make it stylish? 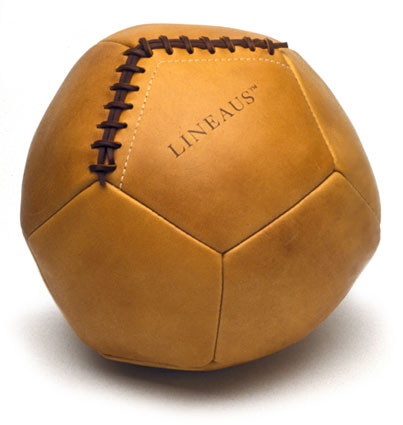 No matter which manly thing you desire, each product from Lineaus is custom made, ensuring a beautifully constructed, highly functional product to stand the test of time. Old school.